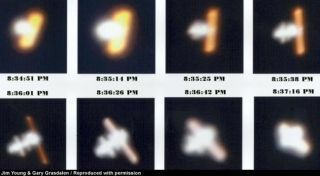 James Young and Gary Grasdalen captured these pictures during a 5-minute pass of the ISS over Southern California. The images were taken June 16 with a 24-inch telescope at JPL's Table Mountain Observatory in the Angeles National Forest. With liftoff of the Space Shuttle Discovery planned for Saturday afternoon, skywatchers across much of the United States and southern Canada could possibly be in for a real treat on Saturday and Sunday evenings. Should weather conditions permit, first in Florida to allow the launch [updates here] and then where you live to offer a clear view, there will be a spectacular opportunity to see both the Discovery and the International Space Station (ISS) flying across your local sky. This is a sight that should easily be visible to anyone, even from brightly-lit cities. The appearance of either the Space Shuttle or the International Space Station moving across the sky is not in itself unusual. Truth be told, on any clear evening within a couple of hours of local sunset and with no optical aid, you can usually spot several orbiting Earth satellites creeping across the sky like moving stars. Satellites become visible only when they are in sunlight and the observer is in deep twilight or darkness. This usually means shortly after dusk or before dawn. What makes this weekend's prospective passages so interesting is that you'll be able to see the two largest orbiting space vehicles in the sky at the same time. After liftoff from Florida, Shuttle Discovery will spend nearly 44 hours chasing the International Space Station around the Earth, ultimately catching up and docking with it around 11:25 a.m. EDT on Monday, if all goes as planned. Check here for mission updates. Appearing as a pair of very bright "stars," the Space Station should appear as the somewhat brighter object and will appear to be leading Shuttle Discovery across the sky. Traveling in their respective orbits at 18,000 mph (29,000 kilometers per hour), both should be visible anywhere from about one to four minutes as they glide with a steady speed across the sky. Should Discovery's launch be delayed, you can still try and sight the International Space Station. Across the northern and central United States and southern Canada, nightly viewing opportunities will extend through at least July 5 and in some cases to July 7. Over the southern United States, the first viewing opportunity will not come until July 3, but then will extend through July 11. It appears that parts of the southwest will be highly favored, with opportunities spanning July 1 through 8. And for southern California, the Space Station will make evening appearances from July 1 through 10. And keep in mind that once Discovery is ultimately launched it should appear to trail some distance behind the Space Station on the first two nights of its mission.